80 • WRAPS • 2 0 1 8 W ell, I certainly hope you've enjoyed the indus- try's premiere annual publication dedicated solely to the professionals involved in the wraps and graphic installation industry. It is our sin- cere aim to support wraps professionals of every level, and, through the sharing of insider knowledge, help them to become more efcient, more professional, more business savvy and more successful. The magazine is put together by the staff of Sign & Digital Graphics magazine, with the help of many professionals from throughout the indus- try. Although WRAPS only comes out once a year, Sign & Digital Graphics comes out 13 times a year and features wraps coverage in every single issue. There are two ways to make sure you receive WRAPS magazine every year. The rst is to become a complete subscriber to Sign & Digital Graphics magazine. You can subscribe to these magazines at www.sdgmag.com—just click the "Magazine" button, then click on "Join Sign & Digital Graphics." The second way is to attend any of THE NBM SHOWS throughout the year. This year's remaining shows include: Cleveland, Ohio, June 15-16; WRAPSCON @ THE NBM SHOW Long Beach, California, August 2-4; Meadowlands, New Jersey, Aug. 23-24; Indianapolis, Indiana, Sept. 13-15; and Charlotte, North Carolina, Nov. 2-3. Be sure to attend WRAPSCON because many of the same experts who have shared information in this magazine will be on hand to provide live instruction and information. For information about the shows, visit https://thenbmshow.com/wrapscon. 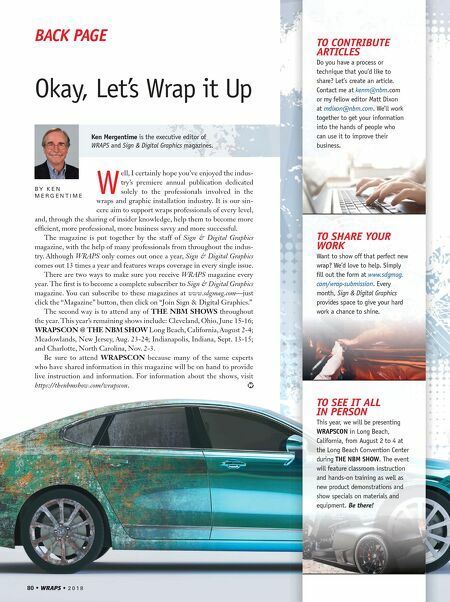 BACK PAGE Okay, Let's Wrap it Up Ken Mergentime is the executive editor of WRAPS and Sign & Digital Graphics magazines. B Y K E N M E R G E N T I M E TO CONTRIBUTE ARTICLES Do you have a process or technique that you'd like to share? Let's create an article. Contact me at kenm@nbm.com or my fellow editor Matt Dixon at mdixon@nbm.com. We'll work together to get your information into the hands of people who can use it to improve their business. 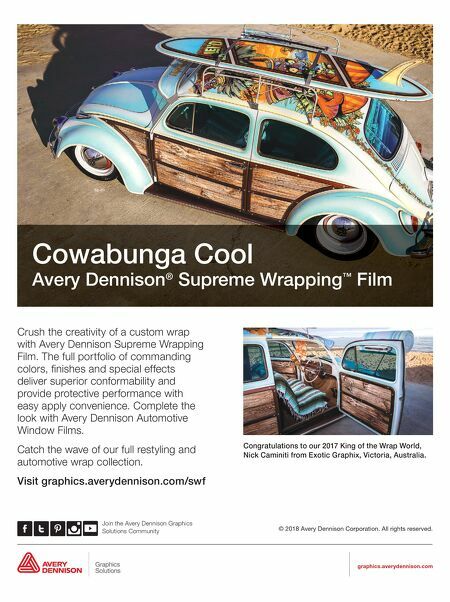 TO SHARE YOUR WORK Want to show off that perfect new wrap? We'd love to help. Simply fill out the form at www.sdgmag. com/wrap-submission. Every month, Sign & Digital Graphics provides space to give your hard work a chance to shine. TO SEE IT ALL IN PERSON This year, we will be presenting WRAPSCON in Long Beach, California, from August 2 to 4 at the Long Beach Convention Center during THE NBM SHOW. The event will feature classroom instruction and hands-on training as well as new product demonstrations and show specials on materials and equipment. Be there!